Skyfire Web Browser 5.0 for Android is more than just an app. Skyfire's new web browser offers an arsenal of intelligent browsing features and enhancements built right into the browser – making Skyfire the smartest app on your smartphone. And it's free! 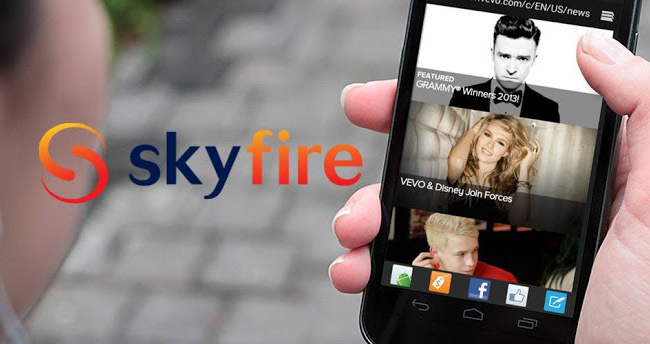 Skyfire is the next generation of mobile browsing – come see why over 20 million users have downloaded Skyfire. Skyfire 5.0 for Android is loaded with features that make browsing the mobile web more social & more useful than ever before. Extensions like Facebook, Twitter, Amazon, Yelp, Related Apps, Offers, Readability and many more allow users to stay connected, find deals, browse apps and save browsed content for later – all without leaving the page they're currently on. Users can add, remove and even create their own extensions. Nearly 20 mobile browser extensions have been added to Skyfire's web browser for the very first time. We've also redesigned the look and feel of the application to make it more simple and streamlined than ever before. Tailor-made Browsing - Skyfire Web Browser offers users a unique way to personalize and modify your own unique browsing experience. Add your own favorite content to the toolbar – Simply click the “Add” button in the Horizon toolbar, and you can pin your favorite web app or shortcut to take your browsing to the next level.